Our product range comprises Antibiotics Medicines such as Zosyn, Infimab 100mg, Meropenem Injection. Uses:- Zosyn Injection contains a combination of piperacillin and tazobactam. Piperacillin and tazobactam are penicillin antibiotics that fight bacteria in the body. 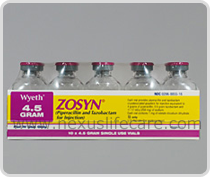 Zosyn Injection is used to treat many different infections caused by bacteria, such as urinary tract infections, bone and joint infections, severe vaginal infections, stomach infections, skin infections, and pneumonia. Zosyn Injection is sometimes given together with other antibiotics.